With its vibrant mix of Islamic and Mediterranean cultures, its many archaeological treasures and the delightful colonial ambiance of its coastal capital, Tunis, it’s not hard to see why Tunisia has been ranked among this year’s top tourist destinations. One of the country’s gems is the ancient city of Carthage on the outskirts of Tunis. According to legend, it was founded by the Phoenician queen Dido in 814 BC, and later formed the hub of the Roman Empire in Africa. Visit this historic city before August 16 and you’ll catch Tunisia’s biggest art event, the International Carthage Festival, which attracts artists from all over North Africa, Europe and the Arab world. Now in its 46th year, the festival takes place in Carthage’s magnificent Roman amphitheatre and features a diverse line-up of theatre, music, ballet and circus events. Highlights this year include performances by the Moroccan singer Samira Said, the Italian star Eros Ramazzotti, the Rovesnik Ballet from Russia, the Iranian tenor Shahram Nazeri and Cirque Mena from France. Not to be missed. Tickets to the Carthage International Festival tickets can be booked atwww.festival-carthage.com.tn. Prices vary. Every August, Scotland’s capital is rocked by an artistic tidal wave as comedians, theatre groups, performance art troupes and musicians flood the city for the world’s biggest art festival – the Edinburgh Fringe. Everywhere you look there’s a cultural event taking place, whether it’s street performers wowing the crowds along the Royal Mile, comedians raising laughs at innumerable spots around town, or world-class drama unfolding at the Traverse, perhaps the festival’s most reliable venue. The atmosphere is electric, with thousands of enthusiastic audience members rushing around in search of top-rated shows and undiscovered gems. This year’s must-sees include Penelope by Irish playwright Enda Walsh at the Traverse, last year’s Comedy Award-winner Tim Key at the Pleasance Dome, and Carl Heinrich Graun’s opera Montezuma at the King’s Theatre, which opens the high-brow Edinburgh International Festival (August 13 to September 5). Stay at the new Hotel Missoni, designed by the celebrated fashion label and boasting one of the best Italian restaurants in the country, Cucina. It’s perfectly situated for festival-going, just off the Royal Mile. Tickets to the Edinburgh Festival are available at www.edfringe.com andwww.eif.co.uk. Double rooms at Hotel Missoni (www.hotelmissoni.com; 00 44 131 2206666) cost from £130 (Dh729), including breakfast and taxes. Iceland has had its fair share of problems of late, with implosions in its financial sector sending the country into bankruptcy last year – and explosions in its volcanic sector sending a great ash cloud right across European airspace earlier this summer. What it needs right now, clearly, is a really good party to lift its spirits. On August 21, the capital Reykjavik celebrates its annual Culture Night. Last year, 100,000 people – nearly one-third of the population of this small North Atlantic island – showed up to enjoy a programme of music performances, art exhibitions and food events, topped by a spectacular fireworks display before midnight. This year promises to be just as good, with the added bonus of a favourable exchange rate making this once-expensive country quite affordable. Splash out on a room at the grand Hotel Borg overlooking the city’s prettiest square and make a reservation for dinner at Fish Market (www.fishmarket.is; 00 354-578-8877), a restaurant that serves the best of Iceland’s distinctive cuisine. Smoked puffin anyone? Double rooms at Hotel Borg (www.hotelborg.is; 00 354 551 1440) cost from €233 (Dh1,093), including taxes. August is one of the best months to visit Mozambique, thanks to perfect tropical weather – clear skies, lots of sun – and excellent opportunities for big-game sighting if you’re in the market for a safari. For those in search of some peace and quiet on the country’s beautiful coastline, seek out the newly opened Coral Lodge 15.41 near Ilha de Mozambique, the former capital. The location, on a peninsula within the privately owned Varanda nature reserve, is so remote that the Dutch couple who run Coral Lodge were obliged to bring electricity to the area. The hotel is modern and luxurious but it retains an authentic feel, and much attention has been paid to design – the roofs of the 10 villas have been thatched in the local style, and furniture is handmade from coconut wood sourced in Zanzibar. You can’t go to the Mozambique coast without taking a dip in the warm blue-green waters of the Indian Ocean. Diving, snorkelling, fishing and whale-watching can be arranged from the hotel, which also has spa facilities and an infinity pool. Top off your day with a romantic dinner at the hotel’s Reef restaurant on the very tip of the peninsula, with food prepared by the Zimbabwean chef Tessa Bristow. Villas at Coral Lodge 15.41 (www.corallodge1541.com; 00 258 266 600 030) cost from US$425 (Dh1,561) per person per night, including taxes. This soft opening rate is valid until December 11 and includes all meals, drinks, all non-motorised activities, a guided tour of Ilha de Mozambique and EVAC medical insurance. Europe can be an extraordinarily beautiful place. Where you go may be a matter of personal taste or sentiment, but there are some stunning sights during Autumn in Europe. It’s like having your own personal art gallery, and a few of the classic tales of old Europe as well. It’s a good time to go there, too. It’s off peak, and you can get full coverage travel insurance in Europe easily. France in Autumn is like Monet’s palette, or an escaped Cézanne. The French countryside is justly famous for its charm, but in Autumn it really puts on a show. Moody Paris is a song, and the special, secret places and old cities are looking even more elegant than ever. You can see why Impressionism started in France, in Autumn. The colours are incredible, and the light magical. The temperatures have gone down from the fierce French summers, and the venerable old stonework in the country seems to be posing for a new generation of artists and photographers. Particularly beautiful are the Vosges, Lorraine, and Bordeaux, where the dazzling landscapes go to work on the senses with riots of colour. The German Autumn is even a match for Canada and the north east United States. Bavaria really shows off, combining its mountains, rivers and forests in stunning shades. 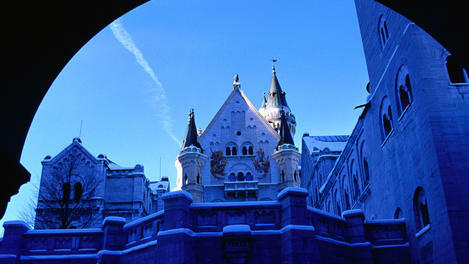 If you really want to get lost in beauty, wander around the Neuschwanstein Castle and Mespelbrunn Castle. These are real tableaux of Old Germany, the land of Beethoven and Gutenberg, and there are many places like this. Swabia in particular is a particularly beautiful place, and the Black Forest lives up to its reputation. This is real Danube country, and as you head to Ulm, on the Bavarian border, you’ll see misty mountains and valleys, ancient ruins like Castle Hohenurach perched on a peak, and endless other feasts for the senses. If you head south to the Swiss border, you’ll arrive on the shores of Lake Constance, another wanderer’s paradise. These are just some of the sights. To see it all, use the train system and see Germany at its best. Valley and a thousand other places. Autumn frosts mix with incredible red and gold canopies, against the green land and endlessly changing skies. The climate at this time of year is also an excuse for eating fabulous food, making yourself extremely comfortable, and avoiding the tourist season entirely. This isn’t just any tour. Europe in Autumn deserves to be appreciated as what it is, a work of natural art. Avoid the tourists, take advantage of cheap fares and online travel insurance, and have a ball.